Franciabigio was a Florentine artist, who closely associated with, though had a distinct style from, his colleague Andrea del Sarto (1486 – 1531). He was born Francesco di Cristofano, but was called Marcantonio Franciabigio or Francia Bigio. 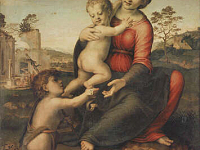 Some of his works now known were once attributed to his contemporary Raphael (1483 – 1520). He was highly praised for his painting of frescos. 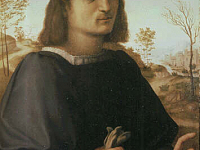 He trained under the Renaissance artist Mariotto Albertinelli (1474 – 1515), who was greatly influenced by Raphael. After his year long apprenticeship there, Franciabigio joined Sarto in opening a studio in the Piazza del Grano. The painter was regarded for having acquired much artistic knowledge and studying anatomy and perspective closely. His fresco works are sometimes compared to that of Quattrocento painter Masaccio (1401 – 1428). In Sarto’s commission for the Basilica della Santissima Annunziata (Most Holy Annunciation) in Florence, Franciabigio contributed a fresco in 1513, Marriage of the Virgin. A year later he executed his Last Supper fresco for the Convento della Calza, done in the style of Andrea Mantegna (1431 – 1506). He worked on a series of frescos depicting John the Baptist after this in collaboration with Sarto again, and then in 1520 executed his Triumph of Cicero for the Medici villa at Poggio a Caiano in Prato, Tuscany. Some of his other works include Young Man with a Letter, Portrait of a Young Man, Calumny of Apelles, and Bath of Bathsheba. 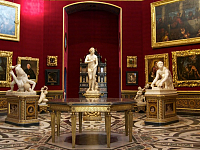 Of his works in the Uffizi Gallery are his Madonna of the Well, and another piece titled, Portrait of a Young Man. His Portrait of a Young Man, at the Louvre in Paris, and also his Madonna del Pozzo, were the works once thought to be Raphael’s.